Finalist for the 2014 Man Booker Prize';J is a snarling, effervescent, and ambitious philosophical work of fiction that poses unsettling questions about our sense of history, and our self-satisfied orthodoxies. Jacobson's triumph is to craft a novel that is poignant as well as troubling from the debris.' 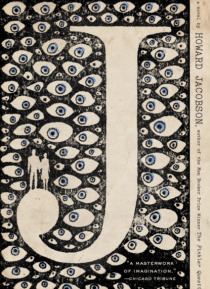 Independent (UK) Man Booker Prizewinner Howard Jacobson's brilliant and profound new novel, J… , ';invites comparison with George Orwell's 1984 and Aldous Huxley's Brave New World' (Sunday Times, London). Set in a world where collective memory has vanished and the past is a dangerous country, not to be talked about or visited, J is a boldly inventive love story, both tender and terrifying. Kevern Cohen doesn't know why his father always drew two fingers across his lips when he said a word starting with a J. It wasn't then, and isn't now, the time or place to be asking questions. When the extravagantly beautiful Ailinn Solomons arrives in his village by a sea that laps no other shore, Kevern is instantly drawn to her. Although mistrustful by nature, the two become linked as if they were meant for each other. Together, they form a refuge from the commonplace brutality that is the legacy of a historic catastrophe shrouded in suspicion, denial, and apology, simply referred to as WHAT HAPPENED, IF IT HAPPENED. To Ailinn's guardian, Esme Nussbaum, Ailinn and Kevern are fragile shoots of hopefulness. As this unusual pair's actions draw them into ever-increasing danger, Esme is determined to keep them togetherwhatever the cost. In this stunning, evocative, and terribly heartbreaking work, where one couple's love affair could have shattering consequences for the human race, Howard Jacobson gathers his prodigious gifts for the crowning achievement of a remarkable career.From the Hardcover edition.